Las Brisas Ixtapa is a luxury 5.5* family friendly beachfront resort located in Ixtapa, Mexico. It features 416 rooms and swimming pools. All inclusive meal plans are available! 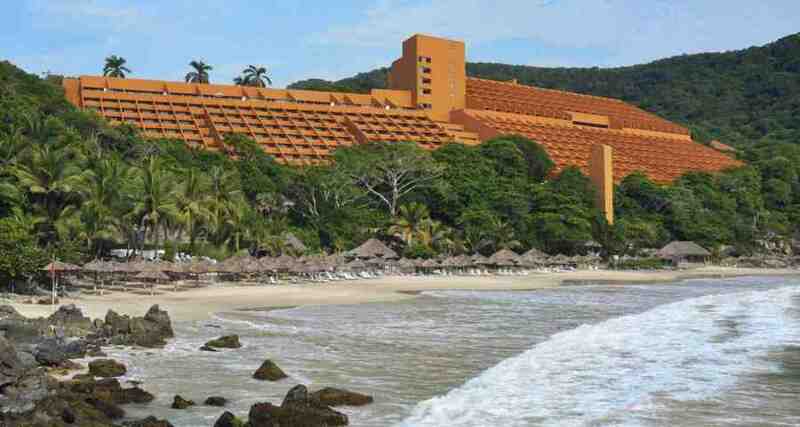 Las Brisas Ixtapa is a resort that has been listed as one of the most beautiful in the world. It features contemporary Mexican architecture, spacious facilities, lovely colored walls, Mexican style furnishings and large outdoor areas where you can relax and unwind. The hotel is surrounded by 35 acres of lush, tropical vegetation and offers an impressive variety of sports and recreational activities, including four spectacular infinity pools and four illuminated tennis courts. This stunning Ixtapa Zihuatanejo property is perfect for both leisure and business travelers. Brisas Hotels and Resorts offer the "In The Pink" Hurricane Guarantee, aimed at reducing the stress and anxiety level associated with traveling during the Hurricane Season by eliminating the risk and guaranteeing that your vacation will not result in an out of pocket loss due to the unforeseen cancellation of your trip due to a hurricane. This offer is subject to change and can be withdrawn at any time without notice.